-- Offering over 50 riffs on the theme, Adams adds everything from mangoes and cranberries to popcorn to the basic recipe, as well as more inventive fare such as a Boston Cream Pie S'more, made up of strawberry shortcake cups, a marshmallow, and chocolate frosting. Those with an aversion to graham crackers will find ideas incorporating everything from chocolate cookies to fresh apricots and even sliced Granny Smith apples to bookend their fillings. 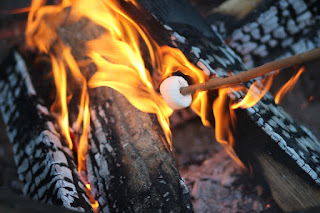 None of the recipes are going to win any culinary awards, but the recipes are simple to replicate, making them ideal for children and young-at-heart marshmallow lovers. • S'more Maker -- Perfect s'mores anywhere in just 5 minutes. Easily stacks six s'mores and securely locks them into place for cooking. Perfect for indoor treats - use in your over or toaster oven. Great on the barbecue - no need for a campfire. • Gimme S'more Appe-Teether -- Appeteethers are patented teething toys made of silicone. They provide the perfect amount of resistance to help soothe babies sore gums. • Doll Food Craft: How To Make S'mores!